Our first and most popular model! 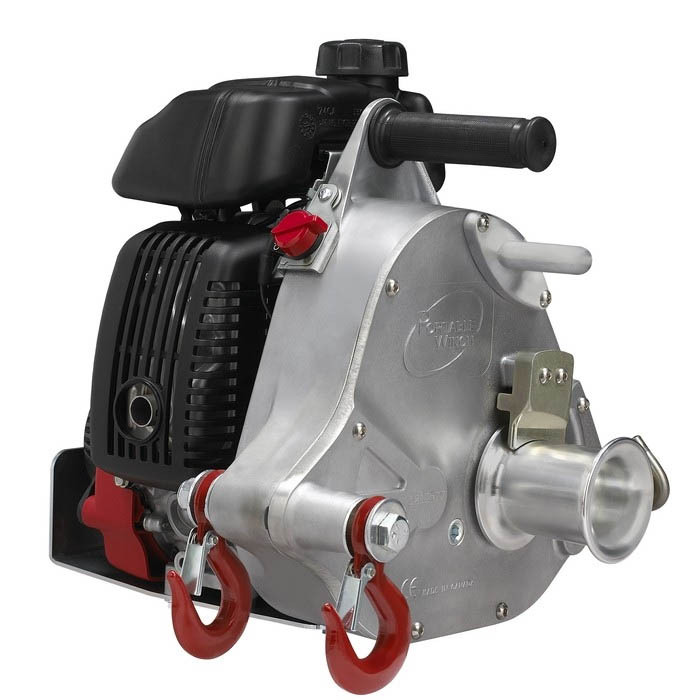 This winch is lightweight, portable, gas (petrol) powered, and has a 1000 kg (2200 lb) pulling capacity. If you ever need to bring down hung-up trees, pull out-of-reach logs, get a vehicle un-stuck, the PCW5000 is for you. Weighting only 16 kg (35 lb), this Portable Winch is easily carried and can be anchored to anything using the provided 2m webbing sling or the different anchoring accessories. Use the Portable Winch with any length of double braided polyester low stretch rope. The rope is tied to the object to be moved and wound three or four times around the capstan drum. When the engine is running, the 57 mm capstan drum rotates continuously and the friction created by pulling on the free end of the rope pulls the object. With the load, will move at a speed up to 12 m/minute (40′/min), depending on the weight of the load. You can also buy the 85 mm (3-3/8”) capstan drum which will give you up to 18 m/minute (60′/min) speed.